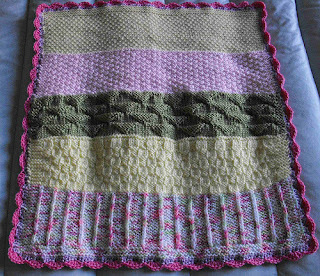 Being knit on size 6 needles, Grandma's Flower Garden is a preemie blanket. 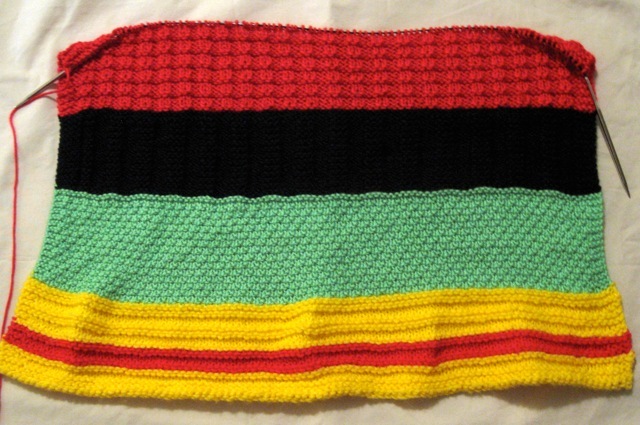 The stitch pattern I used was from an old book, so I don't know if it even has a name. Cinco de Mayo was one of three blankets that arrived while I was gone. These blankets circulate in spurts: I hadn't knit on one for months, and then suddenly I am inundated with them. 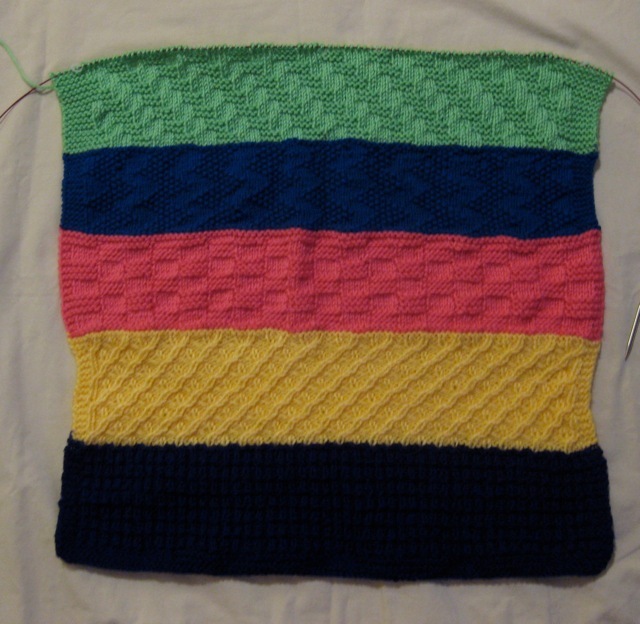 Blanket is being knit on size 8 needles. 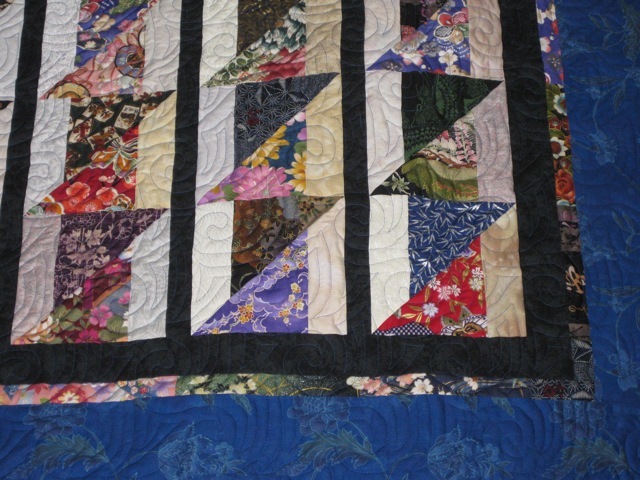 I used the Checks and Ridges stitch for my section. Cinco de Mayo is on the left; Mardi Gras, on the right. 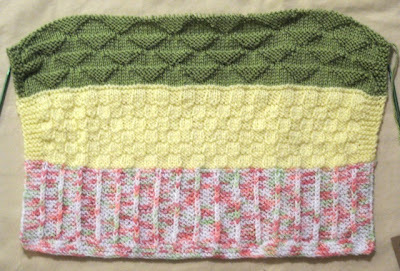 Mardi Gras is a West Coast Oddball Baby Blanket knit on size 7 needles. I used Garter Stitch Steps for my section. The first section of the blanket is a gorgeous, deep purple, but it didn't photograph well. I am using some of fat quarters I purchased last month to make Ohio Stars for a Quilt of Valor that I am naming, Hometown Stars in honor of those hometown stars who serve and protect this country. 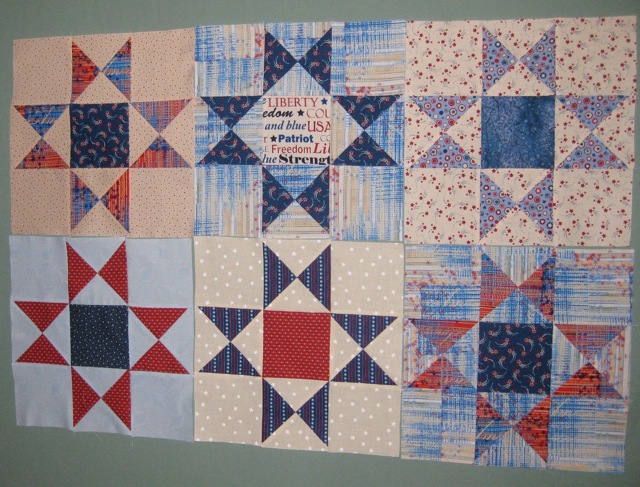 The stars, 12 inches when finished, will be very scrappy. When I saw the July/August issue of Love of Quilting and the quilt named, Stars of the Past, I knew it would be the perfect setting for these stars blocks. The top should be finished by the end of the week. except when someone comes along and makes the wait more fun. Remember the Just One Star program? 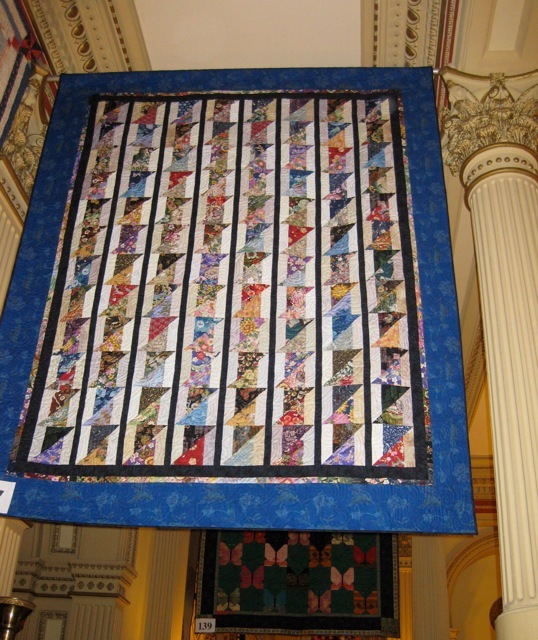 A finished quilt was prominently displayed in the Capitol Quilt show. It was stunning. 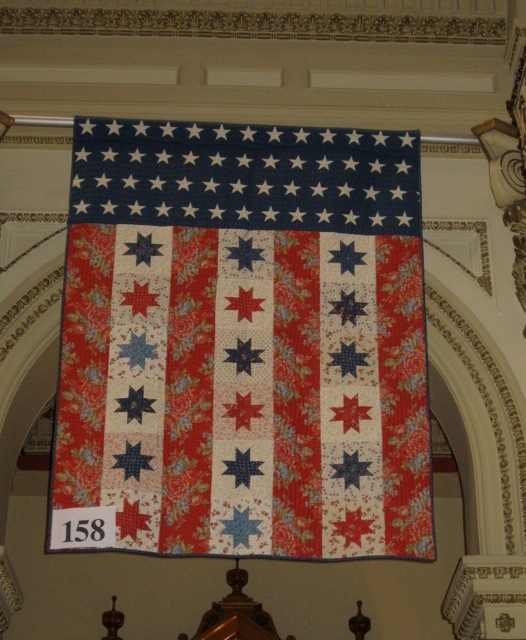 As of last week, quilters have sent in over 12,000 stars for this program. Read about it here. 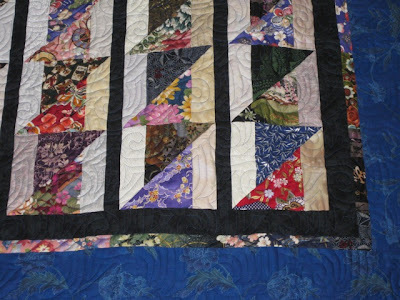 I fell in love with this simple, scrappy quilt. 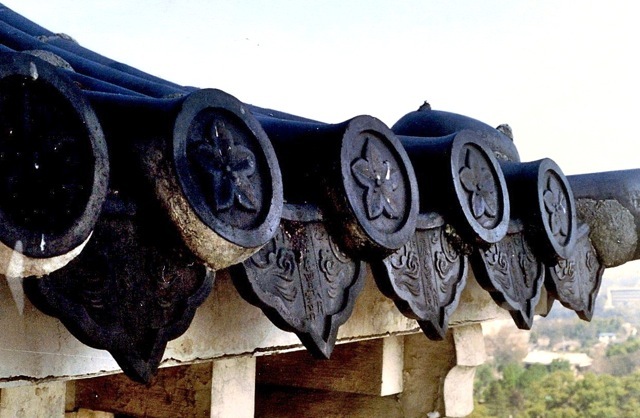 A close-up to show how it was constructed. 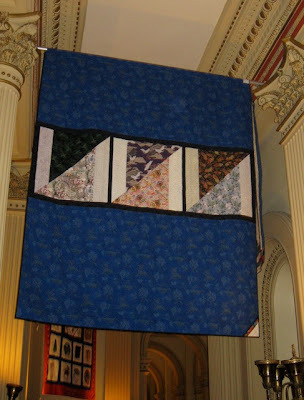 I especially liked the enlarged blocks on the back. Another quilt with an enlarged block on the back. 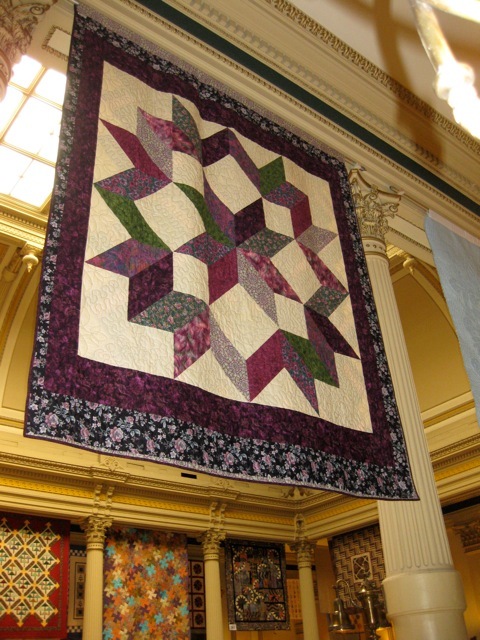 If you want to try making a large block like the one above, Mary's Carpenter Star pattern may be helpful since she has already done the math and gives the cutting directions. 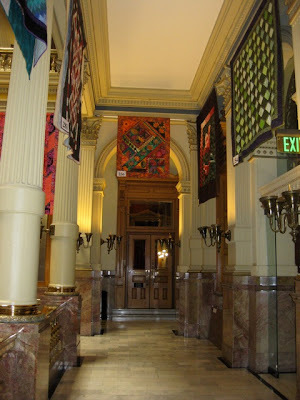 Before leaving for Denver, I discovered the Capitol Quilt Show was scheduled this year (it's held every two years) in the Colorado Capitol building. 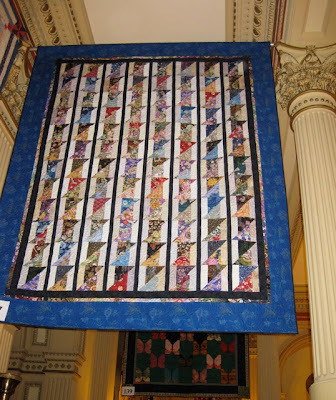 Marilyn and I also attended in 2009. It was exciting to see what is around the next corner. 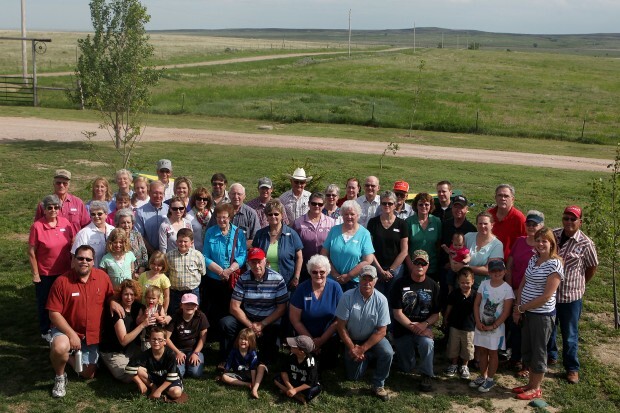 On June 10, 2011, John and Annie Stearns' grandchildren, great grandchildren and great-great grandchildren gathered on the farm near Provo, SD. 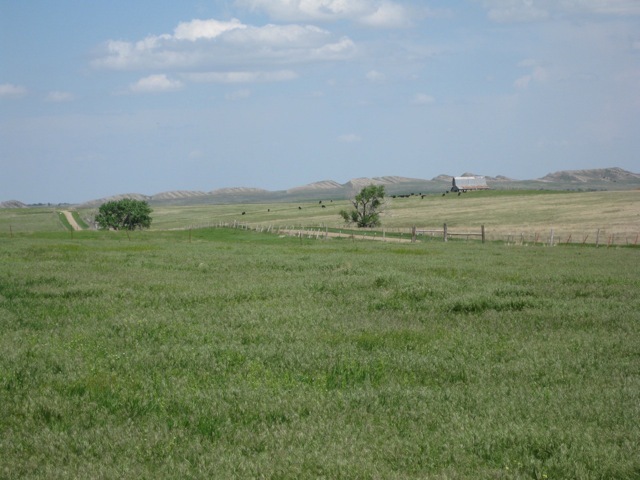 The farm/ranch has been owned and operated by family members for 100 years. 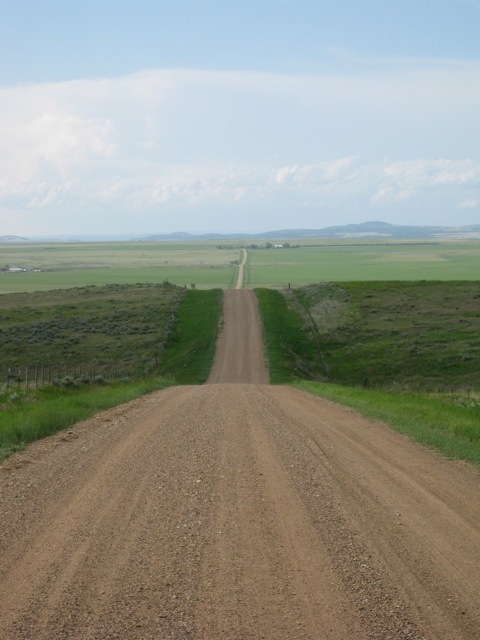 The land has passed through four generations: John and Annie; their son, Ed; his son, Dewane; his son, Jerry. 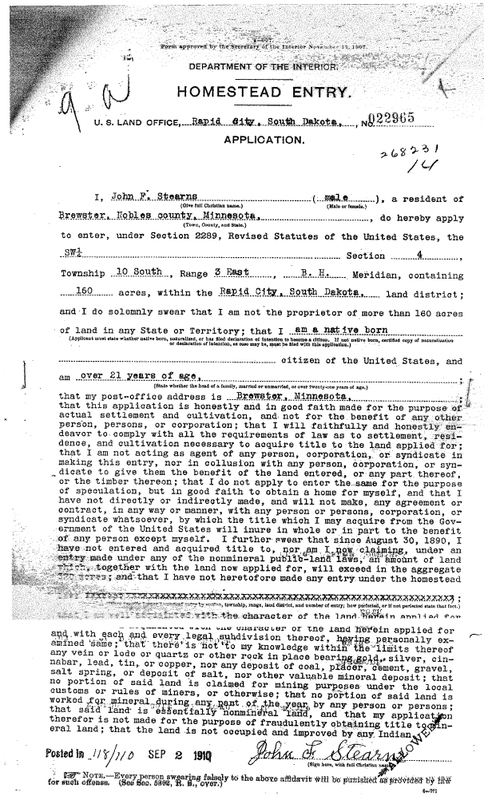 My paternal grandfather filed this application in 1910, and one hundred years later, the land is still being farmed by his great grandson. 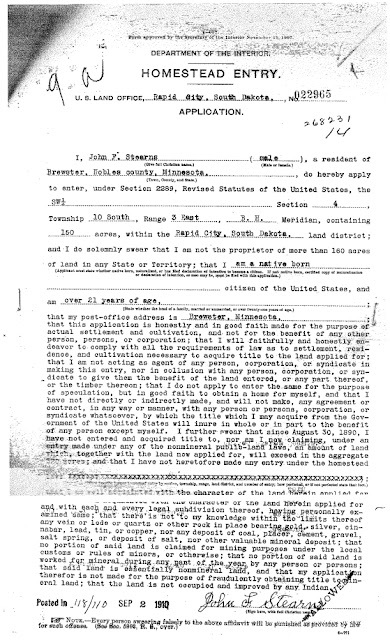 Subsequent deeds confirm it is a Century Farm. 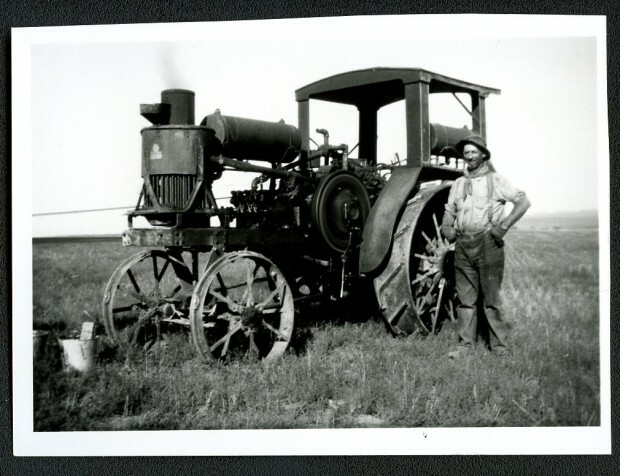 John Franklin Stearns, the patriarch of the South Dakota Stearns legacy, arrived in Provo from Brewster, Minn., in May 1910 with one goal in mind: to stake his claim on federal land and start a homestead. Known by his middle name, Frank was 40 years old. Frank Stearns' wife, Annie, arrived by train seven months later (December 1910) with their five young children: Theodore, 7; Sadie, 6; Edward, 5; Arthur, 3; and Charles, 1. The seven of them squeezed into a 16-by-24-foot, two-room tar-paper shack with no insulation, plumbing or electricity. 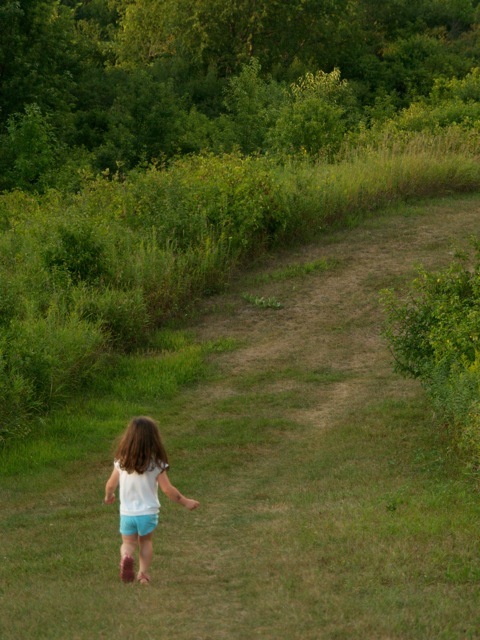 While the children were still young, Frank contracted typhoid fever, causing him to run deliriously through fields full of cactus in the middle of the night. After finding Frank 20 miles from home and thinking he was insane, the sheriff threw him in jail. A doctor later diagnosed Frank with typhoid, and he was taken to a hospital in Hot Springs, SD. 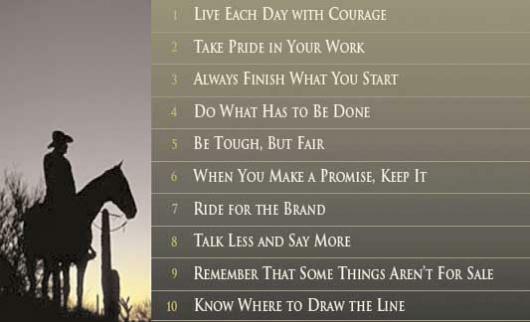 Annie ran the ranch while Frank recovered. In 1927, Frank died from a bleeding ulcer at the age of 57. 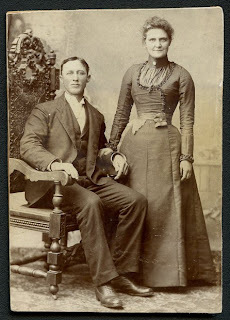 Annie outlived her husband by 23 years, dying in 1950 at the age of 82. 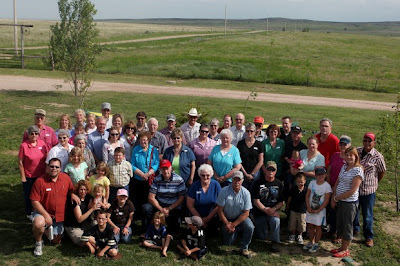 The farm my grandfather homesteaded in 1911 has been in the family for 100 years, so family members from multiple states gathered to celebrate and to reconnect. 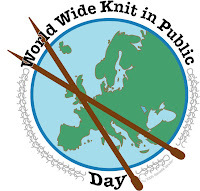 Grab your project bag, find a seat in a public place (park, office building, hotel lobby, bus stop, airport, train station) and put those needles (crocheters, too) in motion at least one day this week. 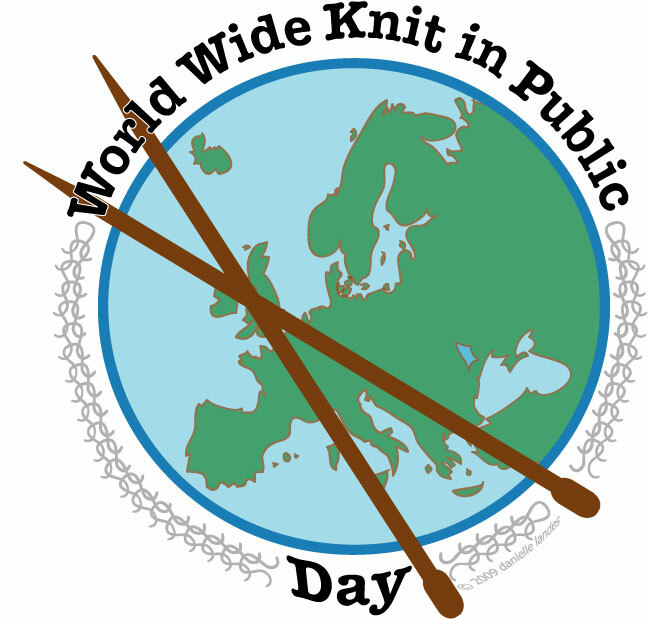 A partial list of planned events can be found on Knitty. Note: Just to clarify, Christianity is practiced today in Japan. Posts may be irregular for a bit: I am going out to play. 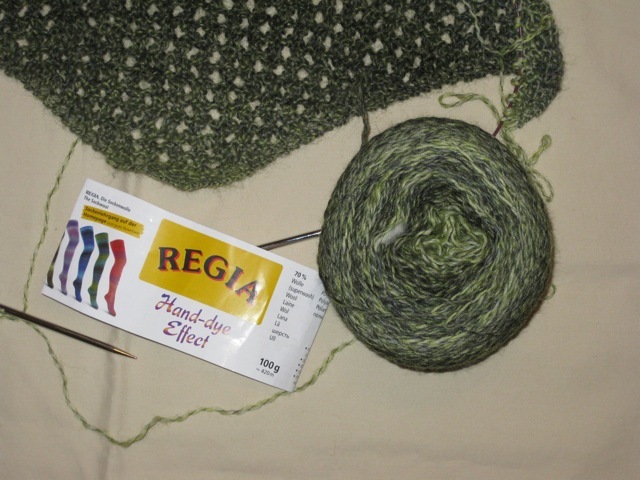 I purchased this yarn in three different colors because I liked how it is dyed from dark to light shades. 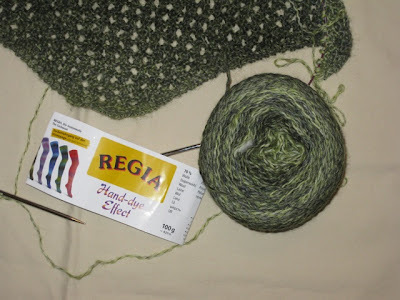 Even though it is sock yarn, the color placement seemed ideal for a scarf, and I am pleased with the effect so far. 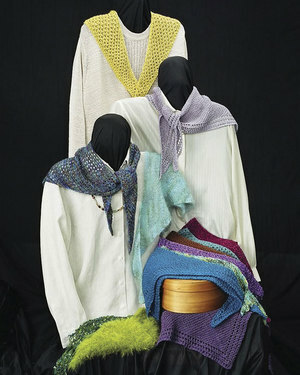 The pattern is Versatile Scarves (AC32) by Evelyn Clark. The yellow scarf, shown at left, is the one I am making on size 6 needles and sock yarn. The pattern includes directions for two scarves which can be knit in four different weights of yarn. 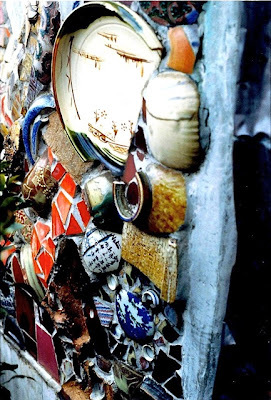 This mural was made entirely from broken pottery. It was colorful and very beautiful in person. 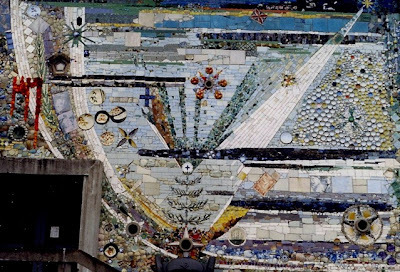 However, when I read the story behind the mural its significance became more poignant than its beauty. 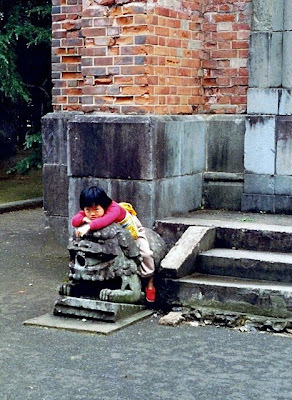 The Shogun in this area of Japan took power around 1600 and decided he did not want anyone to have allegiance to anyone but himself, so he ordered the death of all Christians. 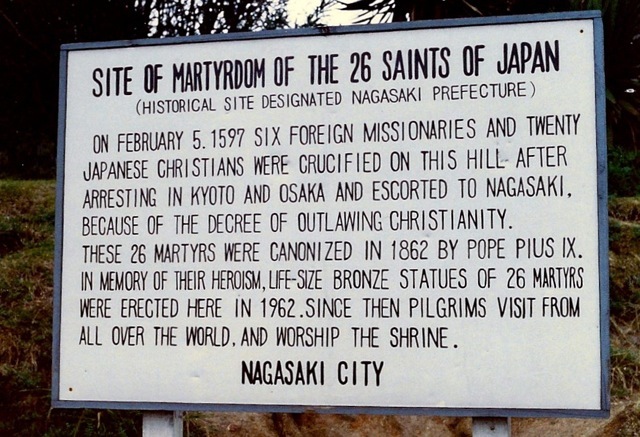 To set an example, his troops captured 26 Jesuit and Franciscan missionaries, three of them Japanese. He forced them to march over 400 miles from Kyoto to Nagasaki in the Winter. 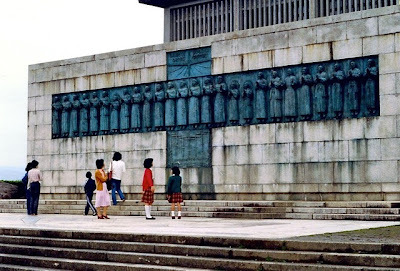 Once there, they were crucified on a hill overlooking the harbor. 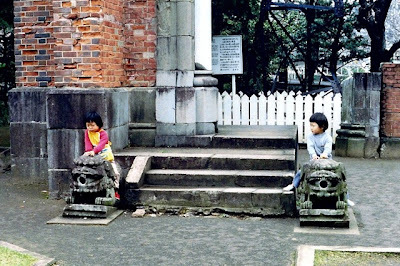 Kenji Imae, an architect from Waseda University retraced the route of the martyrs and collected pottery from every town where they stopped. 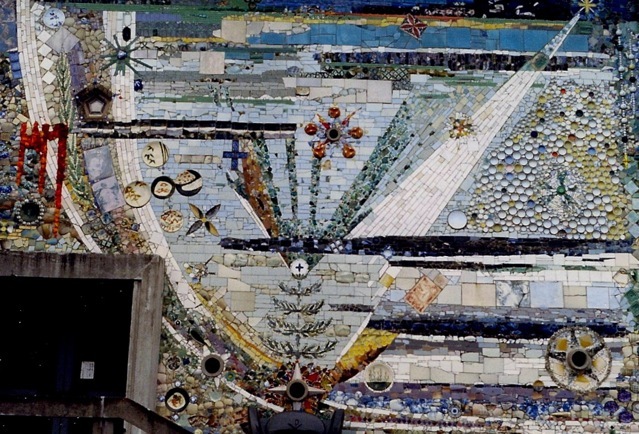 He used the broken pieces to construct the mural on the wall of the museum in Nagasaki.